Very professional and in the same time makes you feel being a relative or a close friend,nice and kind, offering alternativesfor your own well as treatment or procedures. Very professional and in the same time makes you feel being a relative or a close friend,nice and kind, offering alternatives for your own well as treatment or procedures. One of the best doctors I have ever seen. Spent 45 minutes thoroughly discussing my issues with me. Smart and knowledgeable. If you cannot confirm this appointment, please contact the office immediately. Dan Musat is a cardiac electrophysiologist serving the community of Paramus, NJ. 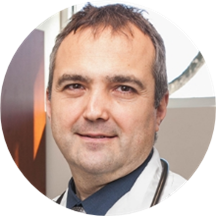 Dr. Musat attended Universitatea de Medicina si Farmacie Carol Davila, where he received his medical degree, and completed his residency and fellowship at Saint Luke's-Roosevelt Hospital Center. Dr. Musat is a part of Valley Medical Group and is affiliated with the Valley Hospital in Ridgewood. He is board certified in cardiovascular disease and clinical cardiac electrophysiology by the American Board of Internal Medicine. Dr. Musat does not treat patients under the age of 14. Dr. Musat takes his time during visits. He answers any and all questions and never makes you feel rushed.